The Forbidden Woods - View topic - Free Grammar Lessons ITT! The following was ripped from www.flashflashrevolution.com and can be found in the Chit Chat section of the forums. Chapter 5: Same sound, different meaning? More to come (though probably not). Now we can go on. Alright, we've got that much down. Congratulations. That was the first part of the lesson for acronyms. On to part two. PCed. While this looks incorrect, it is very much proper. As you can see, Perfect Comboed is the correct spelled-out form of this acronym being used in the past tense. Another example is RPGs. To pluralize Role-Playing Game, you simply add an "s" to "game". There are but a few exceptions to this rule and that exception is not even necessary. It has become proper to pluralize an acronym whose last letter (of the short form) is "s" with an apostrophe. An example of this is SOS's. SOSs is also acceptable, but the crazy people that continue to make rules up about our language prefer the apostrophe. Another such exception is the use of numbers and letters of the alphabet. EX. Sara got 3 A's and 2 B's on her report card. EX. John can now count by 2's, 3's, and 4's. No, not "apostrophe's". In fact, you NEVER pluralize a word with an apostrophe. Let me re-state that in italics on the next line. You NEVER pluralize a word with an apostrophe. I cannot find of any good examples of this occurring here off-hand, but believe me, it happens. Even in the real world, as THIS link proves. The only time you need to use an apostrophe is as a contraction or to show possession. Keep in mind that a contraction is not limited to 40 or 50 examples you learned in English. Almost any noun can become a contraction. "I'm" = I am (I'm posting a message). "They're" = They are (They're not listening). "That's" = That is (That's really horrible). "Lawyer's" = Lawyer is (Your lawyer's dead) (Thanks for the example, LD). This entire section was written entirely by GuidoHunter. Obviously, he knows what he's talking about. This should help you immensely. Squeek touched on part of this, but the rest is not the most well-understood of subjects, so mistakes of this kind are often overlooked. I'll try to clear some of this up. Case 1: Singular possessives that do not end in 's'. Everyone knows how to do these. Add an apostrophe and 's', e.g. "chair's legs", "Mary's face", etc. Case 2: Plural possessives that do not end in 's'. Like with singular nouns, these are often quite obvious. "The children's homework," "the deer's meat," and "the feet's smell" are all examples. Case 3: Singular possessives that end in 's'. Unlike with plural possessives, these WILL NOT terminate in an apostrophe simply because they are singular. "Chris's hand," "Tyler Jones's room," or "my boss's job" all end with an apostrophe and 's' just like the other singular possessives. Case 4: Plural possessives that end in 's'. With these nouns is the ONLY time (save for the two exceptions that will be noted below) that a word terminates in an apostrophe. Examples: "The Millers' house," "the students' homework," and "the rabbits' down." Also note that regardless of the structure, surnames will take the apostrophe after the pluralization. This can look especially awkward with -es names such as with Jones, but the dog belonging to the entire family is still "the Joneses' dog." Obviously, as Squeek has said, "its" is what you should use to denote something belonging to whatever "it" is. It is a singular possessive that does not take an apostrophe, so it is an exception to Case 1. Moses and Jesus. These are the only two singular possessive nouns that terminate in an apostrophe. For some reason, philologists saw fit to let these two figures be special, so don't flip out if you read about "Moses' staff" or "Jesus' word," because they are completely fine. I have also seen books that say the possessive of any singular noun whose last two syllables have an 's' sound should be marked by just an apostrophe. Moses and Jesus fit that description, but I can't think of another word that does, so you're probably best off just adding 's. That's all for now. I think I'm going to have fun writing these. I thought I'd just add something here. When you want to say a specific time period (say, a decade) and want to cut off the first two digits of the year, the apostrophe takes the place of those digits. The correct usage for referring to the 1950s is the '50s. Ah, the joys of punctuation. When to use it? What do certain symbols do / accomplish? You're about to find out. Note that apostrophes are in their own section because you people butcher those most often. We'll begin with end marks. These are the marks that appear at the end of a sentence. This is a period. That last mark there. It's just a dot on a screen. It denotes the end of a sentence. When reading a period aloud, you would start to lower your tone near the last few syllables. The meaning of the period is to bring the sentence to an end and ease into the next sentence. A question mark - ? - looks like that and is used to tell the reader that you are asking a question. This could be something simple like, "Would you like fries with that?" Generally speaking, a question begins with one of the following words: Who, what, where, when, why, how. There are many times when those words are not going to be in there, much like my example. When reading aloud, you would start to raise the tone of the last few syllables when ending the sentence. An exclamation point - ! - looks like this and is used to tell the reader that the sentence is bringing some form of emotion to you in a "shocking" way. It's an emphasis on your sentence. The one thing I hated about grammar lessons in school about this mark is that their example sentences ALWAYS sucked. I recall seeing "What an exciting day this is!" or "What a gorgeous painting this is!" all the time. It was never proper. Nobody talks like that. It's always "This is an exciting day!" or "This painting is gorgeous!" nowadays. The tone of this sentence when read aloud is much higher throughout. We now move onto inner-sentence marks. I hope all of you know what a comma is. It's a mark that, when used properly, can make all the difference in the way a sentence sounds. If abused, it will destroy you. A comma has one major purpose. It is used vocally to tell the reader, "insert a pause here." Of course, the way I just used it is slightly different, but I'll get to that. Commas for pauses: I just used an example of this about three seconds ago. When you start your sentence with some specific words (ie: For example, of course, however, etc) you need to set them off from the rest of the sentence with a pause (comma). This is to make the sentence flow better. When reading the following sentences aloud, just tell me which one sounds better. Of course, there's no right or wrong answer here. Of course there's no right or wrong answer here. In fact, the meaning of the sentences completely changes! The first sentences says to the reader, "There's no right or wrong answer." The second says, "What is wrong with you? OF COURSE there's no right or wrong answer here!" Commas for sets: I'm not even going to get into the lengthy argument in favor of or opposed to the Oxford comma. I just love the Oxford definition and will continue to abide by it. Commas in sets work in a way that places a pause between each set of items greater than three. "I want this, that, those, and these too." (By the way, the British would write this, "I want this, that, those and these too." Which I just think is silly. There's no pause after "those" to tell the person that the last two terms are separate. They just run together.) It's just that easy. 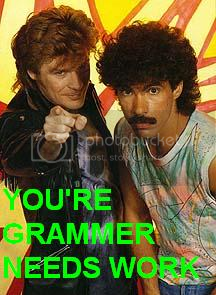 You place a comma after every term except the last. There is no comma after the "and", "or", or "but". Commas for pairs: This is the other most commonly used comma. While this is basically the same thing as the first comma I mentioned, I put it separate for you all. The notion for this is to place a form of an "aside" within your sentence. For example, you might say, "I went to the store, which was very far away, for some eggs." Or something to that effect. I don't care. I hate commas. Let's move on. Colons are easy. Use a colon to tell the reader, "I'm about to say a one or more things that I was talking about before." For an example, you could write, "I'll tell you what I hate most: morons." Or, better yet, "There are only two kinds of people in the world: those that understand binary, and those that don't." Make sure that the items listed after the colon are set off by commas. We also use colons for time (8:45) and other stuff, but that's irrelevant, really. I read someplace that the best way to test for colon usage is to insert the word "namely" where you'd want to put the colon. It almost always works. I HATE THIS MARK. I honestly HATE it to death. I want the inventor of its usage to make up his mind on what to do with it. It's a horrible mark. Now that I've gotten that out of my system, let me explain my hatred. Consider the following (correctly punctuated) sentence. I told the guy that I wanted a "foot." I don't think he caught my drift. I told the guy that I wanted a "foot". YOU CAN. Join me in doing so. You use a quotation to quote direct material or to put a word that might not mean what it's supposed to mean inside. Another use is to mention a word that doesn't belong in the context of the sentence itself. Here're the examples. He said, and I quote, "I hate you." - Note the period INSIDE. Quoted phrases need it. I get that. He told me that I was a "greenhorn". I don't know what it means. I commonly see people putting the letter "a" where it doesn't belong. I will end punctuation there since nobody on a public forum uses dashes, hyphens, semicolons (sadly), etc. Please call this chapter "common mistakes" if you wish. Here, I address common problems occurring in everyday posting that must be made clear. Let me state my theory as to why these problems occur in the first place. Simplicity - Shortening or slightly editing a word to create a small "shortcut" while typing, only to find out that the entire population has also conformed to that method and the original word is lost. Speech - A very common problem. People want to write words the same way it sounds when it is said. This is a problem when spelling and when writing phrases. I will point out a few of the most prevalent. Lack of Information - If you never knew how to use something properly, go with what everybody else says. They have to be right...right? Well, that's just about it. Speech and simplicity are the biggies. Here are some examples. "Should of". I see this often, along with "would of" and "could of". The only reason you type this is because you say it like this. However, this is incorrect. The correct spelling of this word is "should've". The contraction is taking the place of "have", thus making the complete phrase "should have". "Alot". Yeah, this is wrong. The site says, That just about does it. "Could care less". Boy do I hate to see this. It makes me want to pull you aside and mention to you that you're really telling the person, "I care some, maybe even a lot, but now I might care a little less." What you MEANT to say was, "I don't care. I never cared. I will continue to not care." Case and Point. Qualy sent this one in. It's "Case in point." Insert big explanation as to why this is later. The order goes: right spelling, wrong spelling(s). Chardish has written a lovely article to be amended into this document. I found it fitting to go here. I'd like to recommend a section on commonly misused phrases. I can think of a few. "For all intensive purposes." This phrase does not exist. The correct spelling is "for all intents and purposes." E.G. vs. I.E. vs. A.K.A. Global rule: All of these acronyms always have a period after each letter. At the beginning of a sentence, all letters are capitalized. Anywhere else in a sentence, all letters are lower case. E.G. is short for the Latin exempli gratis (a free example). It means "for example" and can be used anywhere that you could use the words "for example." It is a dependent clause, which means it should be separated by a comma from the main clause of a sentence. Example: "I need you to write a paper on a natural science of your choosing; e.g., biology or physics." I.E. is short for the Latin id est (it is). It means "that is" and can be used anywhere that you could use those words. It is typically used to give further explanation to something. It is a dependent clause, which means it should be separated by a comma from the main clause of a sentence. Example: "We didn't think he was doing a good job, i.e., we hated his guts and wanted him fired." Example: "She was a lady of the night, i.e., a prostitute." A.K.A. is short for "also known as" and should only be used literally, in that sense. Do not put a comma after it anywhere. Example: "The place was known as Red Herring's Bar and Tavern, a.k.a Big Red's." Example: "She was a lady of the night, a.k.a. a prostitute." You'll notice that "a.k.a." and "i.e." can be used interchangeably sometimes, but not all the time. The first examples for each of those cannot be interchanged. Take care to pay attention to what the acronyms stand for to differentiate the meanings. But Squeek, some words sound the same and are almost spelled the exact same? How can we tell the difference? If you ever run into that problem, here's a nice list of the proper uses of the most commonly mistaken words. Accept - Accept is a verb. Its meaning is "to take something in". Accepting something is receiving something. I accept this Grammy award on behalf of such and such. Except - Except is a special word used in order to exclude something from a previous statement. Everybody here is smart except for such and such. Affect - Affect is a verb. To affect something is to cause it to do something it may not have normally done. I affected the thermal reactor by throwing in some candy. Effect - Some like to explain effect as what comes after an affected item. It is what HAS happened to the item. What effect can drugs have on your mind? Bare - Bare means raw, or down to nothing. People often use the phrase "bare minimum" in this case. We're down to the bare necessities for survival here. Bear - Almost always associated with an animal. For some reason, there are two special cases. "Bear with it" and "Bear children" are those two special cases. Winnie the Pooh is a bear. Carat - The measurement of weight in a precious stone. Can be used as "karat" as well when referring to gold alloy. This is a solid 15-carat diamond. Caret - Carets are your friends. A caret is used so many times and is misused so many more. This is a caret -> ^ . It is used as an exponential display device, an insertion device in proofreading, and to make some annoying anime-esque faces. ^_^ / 2x^2 = 2x squared. Carrot - So simple. A carrot is a vegetable. It is nothing else. It is that nice orange vegetable that we all seem to enjoy eating. Karat - Used to measure the proportion of pure gold in an alloy. Also used alongside "carat" to display gold easier. 24K gold is really hard to find. Cite - To cite something is to reference it. You must use citations when quoting somebody else in order to avoid a call of plagiarism. Cite your sources to prove your worth! Sight - Vision-related. Sight is your sense of seeing things. You can also use this term when referring to a rifle with a scope on it. That's a sight for sore eyes! Site - Location-related. A site is a place. A website is also a place. Very easy stuff here. The construction site was off-limits to most people. Dual - Two of something. Duel - A two-person battle. Fair - A description of the plausibility of something or an event. You can say that something "is not fair", which means it is one-sided or just not according to your standards. I did not think it was fair that the fair closed early this year. Fare - Money for a ride, or how someone handles something. They did not bring their fare money. I hope they fare well without it. For - This word is used to allocate a location to which something is going. When you do something, you do it FOR something. I'm raising money for the children. Fore - Golf term. It is what you shout when you hit the ball and realize there's a possibility somebody may get hit by it. Also used to describe something in front of another thing. Careful attention must be taken to present the foreground as well as the background. Four - Alphabetical representation of the number "4". There is no other purpose. Please note that adding a "0" onto this makes it "forty", not "fourty". I can count to four. Its - Showing possession of an object that is not a human. "The dog's bone" becomes "its bone." Rule of thumb: replace with "his" or "her" and see if it still makes sense. You don't want to mess with its stuff. That thing will destroy you. It's - IT IS. Simply that. The only exception is that sometimes it means "IT HAS". There's no other time to use this. Rule of thumb: replace with "it is / has" and see if it still makes sense. It's a shame so many people confuse this rule. Passed - Showing something is following the action of passing. Hard to explain, but you would use this with passing gravy, or passing an exam. Past - Time / distance. The opposite of "future" is "past". When something just moved ahead of you, they got past you. When using in the form of action, usually a verb comes before it. We drove past his house, but all the lights were off. Sense - A sense is one of the five things you can do to identify something. It is also a form of expressing intellect. It's common sense that the sense of smell is the best! Since - Generally a replacement for the word "because". Since you're here, why not clean the (whatever)? There - If it's not "their" or "they're", it's always "there". Generally expresses a location of an item, but means other things. Just remember the first line I said and you'll be fine. Their - Only one thing: possessive. This is to show a group of something's something. Very simple. I can't believe everybody left their backpacks here! They're - They are. Only they are. Nothing else, ever. If you cannot replace "they are" for "they're", you're wrong in using it. What are they doing? They're destroying private property! Than - Comparison word. That's all. Why are you not smarter than I am? Then - Used both to express a non-specific time and the second+ item after something else occurs. If x=9, then y=17. First you add 5 to x, then 14 to y. To - If it's not "too" or "two", it's "to." Usually used before a verb to have it in base format. We're going to go to the mall. Too - Also and excessive. One or the other and nothing else. You can include something in something (also, as well) and use "too". You can say something is "too much" of something. I, too, think that at 10% sales tax is far too much. Two - Alphabetical representation of the number "2." This is the only use for this word. Now I've forgotten how to count to four and can only count to two. Weather - Climate in a specific area. Describing rain or snow is describing weather. The weather outside is sunny with a low chance of rain. Whether - Used to determine if something is one way or another. I can't decide whether to vote for Bush or Kerry. Whose - Possessive. When used as a question, it is asking who some item belongs to. Who's - Who is/has. There is no other rule for this. Who's been eating from the cookie jar? Who - Subject form. Explained by Guido. Whom - Object form. Explained by Guido. To whom are you giving this? Your - Possessive. Many other meanings, but the simplest way to remember to use this is if "you are" doesn't fill in for the word. It's your time to die. You're - You are. Nothing else. If it doesn't fill in, it's "your". You're going to regret that. Amount refers to a quantity of something. You use words like "little", "less", and "much" when referring to amounts. Number refers to the number of something. You use words like "few", "fewer", and "many" when referring to numbers. Basically, "number" is used for things you can count. You bring things to events you are coming to. You take things to events you are going to. This is hard, I know. Read the guy's site. Good is an adjective. Well is an adverb. Use them as such. Read his site. Quite simple, really. You cannot itch something. It just isn't possible. An itch is a feeling you get that makes you want to scratch. So simple. A setup is like a configuration. My computer setup rules. DJShox's musical setup is quite nice. You have to set up the setup at one point. That is to say, you need to put everything in place during the set up. Generally speaking, "that" refers to an object that is not human and "who" refers to a person who is human (see the example here?). It's impolite to refer to a person as a non-human. This is a difficult distinction, but it is generally assumed that "that" will not be preceded by a comma and "which" will be. I have nothing else to offer on this one. Okay, let me start by discussing the simple sentence structure of the English language. We have an SVO system in English, that is to say, a simple sentence will begin with a subject, then have a conjugated verb which may or may not be followed by an object (Japanese, by contrast, has an SOV system). The sentence "I hit the ball" has those three parts. "I" is the subject, "hit" is the verb, and "the ball" is the object. I have a chain of logic with this, so please bear with me; I know y'all aren't first graders. Now, when it comes to people and the words that represent them, there are often two different words that represent the same thing. Such words are I/me, we/us, he/him, she/her, and they/them. Obviously, these words, although they represent the same things in their respective pairs, cannot be used interchangeably, so there must be a difference. That difference is that the first word in each pair is the subjective form, and the second is the objective form. As you may have guessed, the subjective form is used when the idea represented by the word is the subject of the sentence, and the object is used when the idea is the object. Example: I hit the ball. The ball hit me. This is why it's incorrect to answer a ringing phone and, upon the other end asking for you, say, "This is him." You should, in fact, say, "This is he." Also, you can now understand why it's so wrong use the common phrase in its original form of, "Woe is me." Read: Woe is I, by Patricia T. O'Conner. Now that that's been said, we're now ready to cover the differences between "who" and "whom." Simply put, "who" is subjective and "whom" is objective. But there is one more thing I need to add. When you have a prepositional phrase (a preposition followed by a noun or a noun phrase), the noun part is considered the object of the preposition. Because of this, one of those personal subjects will always take the objective form when it follows a preposition, as will whom. This also applies to whoever and whomever. However, the object of a preposition can be an entire clause (a phrase with both a subject and a verb). Because of this, you can have the subjective form of a word following a preposition, as in the sentence, "He was before whoever was last." Ordinarily, you would use the objective form because "before" is a preposition, like when you say, "He was before me," but since the object of the preposition is a clause you need a subject, like in, "He left before I arrived." This leads me to a VERY common grammatical error regarding comparisons. WRONG: You are better than me at Stepmania. Whenever you use "than" for comparisons, you need to realize that you will often leave out a verb that is understood. RIGHT: You are better than I at Stepmania. It is understood that you are saying "You are better than I am at Stepmania, but just because you don't say it doesn't mean it's not there. Just think: you wouldn't say, "You are better than me am at Stepmania," would you? The last thing I want to cover is regarding prepositions. Technically, it is illegal (in the grammar sense) to end a sentence with a preposition. Now, this is one of the less-respected rules simply because being completely compliant with it can make for some extremely awkward sentences, and sometimes even I can't figure out how they should be worded. However, most of the time they make sentences look much better. WRONG: She is the one I gave the present to. RIGHT: She is the one to whom I gave the present. And thus I end my second entry. Random fun - ATM, PIN, UPC, and HIV don't need extra words after them. Telling someone to use an "ATM Machine" is like telling them to use an "Automated Teller Machine Machine". Same goes for "Human Immunodeficiency Virus ", "Personal Identification Number", and "Universal Product Code". This same rule applies to the "Rio Grande" which, in Spanish, means "Big River". Adding another "river" to it is just redundant. For more Spanish goodness, consider the "Sierra Nevadas". "Sierra" means "mountain", so adding a second "mountain" to the mountains is just crazy talk. "RSVP Please" is also quite silly to say since we should all know that "RSVP" is French for "Reply, please" (répondez s'il vous plaît). Likewise, there is no "CD-ROM Disc" or "DVD Disc". The "D" in both those acronyms stands for "disc". You may not know that the Middle Ages are not referred to as the "Medieval Ages" because "eval" means "age". And as another side-note, "XMas" is religiously sound, so tell all your Christian friends to bug off if they whine about it. Last edited by Anon E. Moose on Fri Dec 21, 2007 10:34 pm, edited 1 time in total. Staff: Feel free to add or subtract to this as you see fit. I haven't had time to edit this for content due to work in a few minutes.